Is the Old Testament just a collection of loosely related books? Or is it fair to consider it a ‘book’ in its own right, with discernible plot, characters, and recurring themes tying together the individual ‘books’? In Dominion and Dynasty Stephen Dempster attempts to illustrate the latter, believing that, “the Hebrew Bible, despite being composed of many texts, is not for that reason precluded from being a Text” (21). Seeing the OT canon as a carefully composed Text, Dempster attempts to read it in a literary manner, emphasizing the unity. A unique element in this book is Dempster’s reliance on the Hebrew canonical order, rather than the one we find in our English Bibles today. He holds that this is how the OT would have appeared to Jesus (36), and therefore it is important for us to see it as He did. Taking this literary approach, Dempster particularly traces two prominent themes of dominion (land) and dynasty (seed) throughout the OT, showing just how cohesive the message of OT really is. The Old Testament really does have a plot and really does have prominent ongoing themes threading throughout the tapestry of stories and prophecy. The majority of Dominion and Dynasty is made up of Dempster taking a guided tour through OT books and making literary observations and connections along the way. This approach of reading the OT as a single literary Text is fruitful and refreshingly welcome. Too often we can read individual books in isolation from one another, when we know there is one unifying story tying them together. This is the sort of thing we all assume until we un-learn it from critical scholarship. Dempster wants to take the canon back! This is much needed today for students of the Word. As for the details, much of Dempster’s insights are particularly illuminating but sometimes they appear to be a stretch. It appears to me that most of these assertions have scholarly support behind them, but Dempster spends little time proving his assertions here, and more time simply noting these links and then moving on. This results in an easier read (the book would easily double in size if every assertion were supported), but to be convinced of these connections elsewhere. One who has not elsewhere been convinced that the garden of Eden was intentionally described with ‘temple’ language will unlikely be through this book. However, for those who are familiar with some of these insights, I thoroughly enjoyed Dempster’s large-picture observations. Other connections, such as the Hebrew word for ‘vanity’ (hebel, e.g. Ecclesiastes 1:2) “echo[ing] Abel’s name “forcefully”, just seemed dubious. 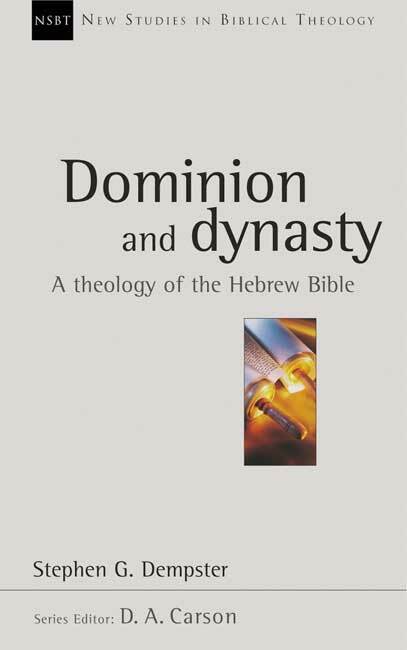 Dominion and Dynasty is a unique biblical theology book and has the potential to be very impacting. There are numerous insights here awaiting to be unpacked in personal study and passed on to others through teaching. I’d recommend this book for pastors or serious students of the Word who want to get a bigger picture of how the Old Testament works. More than a collection of insights on a collection of books, Dominion and Dynasty presents a holistic theology of the Old Testament, Jesus’ Bible. Many thanks to IVP UK for providing a review copy of this book. All opinions are my own.